One of the main components in treatment for drug and alcohol addiction is counseling. Many addicts may think that all they need to do is detox from their drug of choice in order to recover from addiction. The reality is not that simple. You need the necessary set of tools in order to battle any cravings or a future relapse. Not only will drug addiction counseling help with your recovery, it can also treat any underlining mental health conditions you may have that plays a part in your addictions. Our drug rehab in Pennsylvania provides customized counseling services for all patients who need help transitioning back into everyday life. Even after you have medically detoxed from drugs or alcohol, you’re still at a high risk for a possible relapse. There are many psychological and social factors that can cause a relapse such as stress, returning to your old environment, and hanging with friends who continue to use drugs and/or alcohol. It’s nearly impossible to resist these temptations; but with counseling, you’ll not only learn why you became addicted to drugs and alcohol, you’ll also know how to cope with challenges without returning to old habits. At Clearbrook Treatment Centers, our drug addiction counseling puts an emphasis on relapse prevention techniques for all patients. If you are in need of addiction treatment in Pennsylvania, there is hope for regaining control. At our drug rehab in Pennsylvania, we provide all our patients with a customized treatment plan to help with the person’s individual needs as well as his/her addiction. Your plan will always include group therapy sessions and individual counseling. In addition, you may attend groups specifically designed to fit your individual needs, such as grief, gender specific therapy, and mental health treatment. Individual therapy for addiction treatment is beneficial for a multitude of reasons. Most importantly it helps establish a relationship with your counselor and illustrates the value of learning to trust another person. It also allows you to discuss issues you may not feel comfortable talking about in a group setting. In addition, individual therapy is helpful for those who are suffering from a dual diagnosis – someone who is suffering a mental illness in addition to a drug/alcohol addiction. That’s because a disease such as depression or bipolar disorder needs special treatment that is separate from counseling for addiction treatment. Group therapy, as one of the oldest forms of recovery programs, is an excellent method. Following well-known 12-step programs such as Alcoholics Anonymous and Narcotics Anonymous, you will receive the support you need to battle your addictions. The goal of this type of treatment is for those who are battling substance abuse addiction to learn what really drives their addiction. 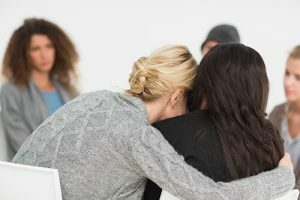 In addition, the patient will learn that they aren’t alone in this battle – there are other people out there with a similar story who have the same feelings and thoughts about their substance abuse. If you have a drug and/or alcohol addiction and live anywhere in Pennsylvania, New York, or New Jersey, get the help that you need today. Contact Clearbrook now and get on the road to recovery.